The PADI Boat Diver programme makes scuba diving in Thailand easy - just take 1 giant step off the back of the boat and you're in the water! Boats and diving obviously fit together like hands in gloves. You can only reach some of the best dive sites only by boat, and this is true of most of the diving in Thailand. And diving from boats is more convenient and easier than shore diving in many ways, and it's great fun to spend time out on the water with your friends between dives. While diving from a boat isn't difficult, there are some special procedures that make boat diving more fun, such as the lines you use when diving in currents. Using current lines effectively may make the difference between an easy and exciting dive, and a tiring and not-much-fun undertaking. On Thailand dive boats, the trip leader usually explains the procedures you'll be using, but a great way to learn more about boat diving is in the PADI Boat Diver specialty course. 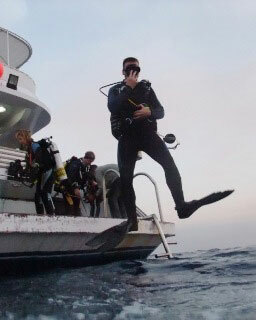 The Boat Diver specialty shows you the broad, basic procedures used when diving from boats. You learn about using current lines, different entry and exit procedures, and the organisation of getting kitted up for the dive. Besides diving procedures, you also learn useful information like how to pack for boat diving, avoiding seasickness, boating basics and boating emergencies. During the programme you'll go on 2 open water dives, which must be - you got it - conducted from a boat. (Both dives may be conducted in 1 day). It's a good idea, but not required, that you enrol in this programme to learn the techniques and procedures for diving from different types of boats (inflatable boats, hard-hulled day boats, cabin cruisers, Thailand liveaboards, sailboats, etc). That's a good thing - the more boats you dive from, the more diving you do too! And, the Elective Boat Dive from the Adventures In Diving counts toward certification requirements for this specialty at the discretion of the instructor. To start the course you'll need at least your Open Water Diver certification.